The ground floor entrance to the 25Hours Bikini Hotel Berlin. “So where are the bikinis?” That was my first thought when I entered the hotel… and I’m sure I’m not the only one with that thought! As I stepped inside, I was greeted by a concrete-clad, industrial-looking space with a car in the middle and bicycles hanging from the ceiling. Very funky! A massive art screen on the back wall complemented the edgy feel of this space. I turned left and saw two lifts. A sign on the wall read: “Need Some Sleep? Go to the Third Floor.” Every night, upon my return to the hotel after another long day in Berlin, I would wait at the lift and answer that question out loud, “Yes, please! I definitely need some sleep!”. A simple sign but I loved the interaction it provokes. Back to the bikinis! There are none. Haha! The 25 Hours Bikini Hotel Berlin is housed in a newly renovated complex that when completed will be a funky new addition to West Berlin, which in the past decades has perhaps been eclipsed in the ‘cool factor’ department by East Berlin neighbourhoods like Prenzlauer Berg and Friedrichshain. Built in the 1950’s, the Bikinihaus, as it was called by locals, was in its time, an icon of the post-war redevelopment of West Berlin. The complex had an open-sided floor spanning its middle section, giving it the appearance of a bikini. Hence, the name. The complex lost much of its lustre after the fall of the Berlin Wall but now, after extensive renovations, it’s ready to shine once again, with the 25Hours Bikini Hotel as one of its stars. I took the lift to the third floor and found the reception. On either side of the reception were big open spaces with cosy nooks and corners, furnished with designer coffee tables and chairs. I caught a delicious whiff of freshly-baked pastries and turned to find the Bakery in one corner. 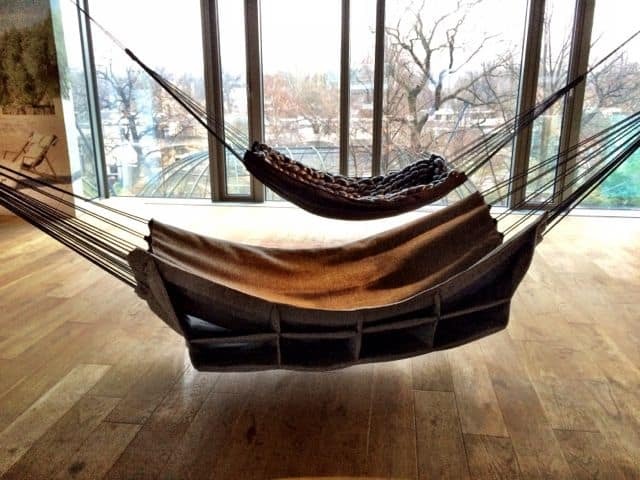 Next to it were giant hammocks that offered its guests a gorgeous view of the Berlin Zoo next door. I could literally see orangutans and giraffes right outside the window! Hammocks with a view of the Berlin Zoo! The hotel offers three room sizes: M, L and XL. These have either a City or a Park (Zoo/Tiergarten) view. My M room was on the 5th floor and had a view of the City, including one of Berlin’s most iconic monuments, the Kaiser Wilhelm Memorial Church. At 23 square meters, it wasn’t very big but its appealing design which made efficient use of the space made it terribly inviting. The bed was big and comfortable. There was a big bathroom table/sink, a shower area and a separate WC. There was another table that spanned the length of the big window. Padded with cushions on either end, the table also functioned as a cosy corner to sit and relax. A smartphone dock with a stereo system complemented the relaxed feel. My favourite switch in the whole room was the one in the bathroom that had a sign next to it saying: “warm feet” (to switch on the floor heating). Heaven! Cosy corner by the window in my room. The City view, with the iconic Kaiser Wilhelm Memorial Church. Wherever I went in the hotel, I was drawn to the artwork, designer furniture and quirky signs. Even the most mundane signs like ‘Exit’ and ‘Do Not Disturb’ were given a fun twist that made me smile and at times, laugh out loud (LOL!). Fab artwork and funny signs. 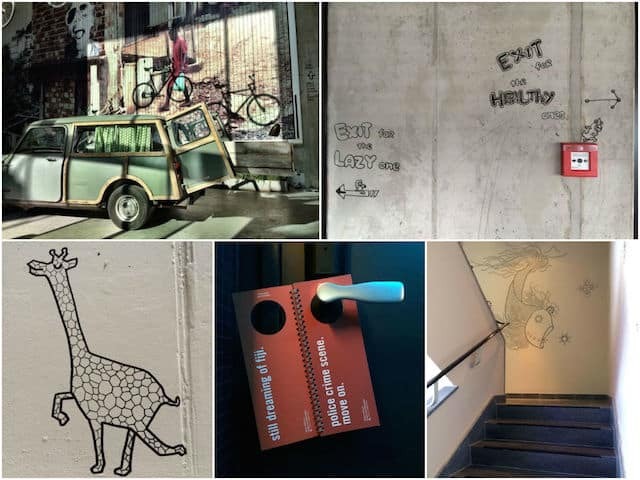 Clockwise from top left to right: the ground floor; signs for the stairs and lifts on the 10th floor; artwork in the stairwell; ‘Do Not Disturb’ signs; animal drawings can be found all around the hotel reflecting the Jungle theme. The tenth floor was my favourite space. Here’s where the Monkey Bar and NENI restaurant are located. An outdoor terrace wraps itself around the entire floor, offering 360-degree panoramic views of Berlin. 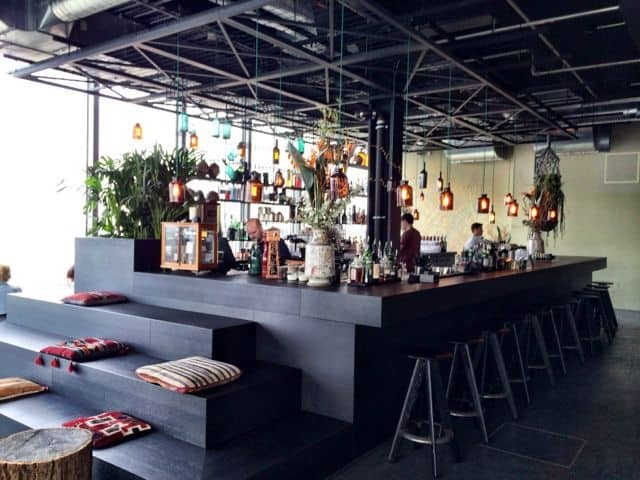 Both the bar and the restaurant are already some of the hottest spots in Berlin, and rightfully so! I loved the loungy atmosphere of the bar, where you can sit back with a drink and watch the animals in the Berlin Zoo below. Cosy corners with a view of the city. The view of the zoo from the Monkey Bar is a hit amongst both locals and visitors! The restaurant serves a variety of cuisines in a casual ambiance – tables line the large windows or you can choose a table in the open greenhouse in the middle of the restaurant! Having breakfast here with a stunning view of Berlin and the monkeys, giraffes and flamingos below me was a pure delight each morning! The breakfast itself was a treat: with hot and cold buffets, fresh juices and a terrific Nespresso machine that made the most awesome Latté Macchiatos! The glasshouse inside the NENI restaurant. The view of the Zoo and the Tiergarten park from my breakfast table each morning! The terrace on the 10th floor. 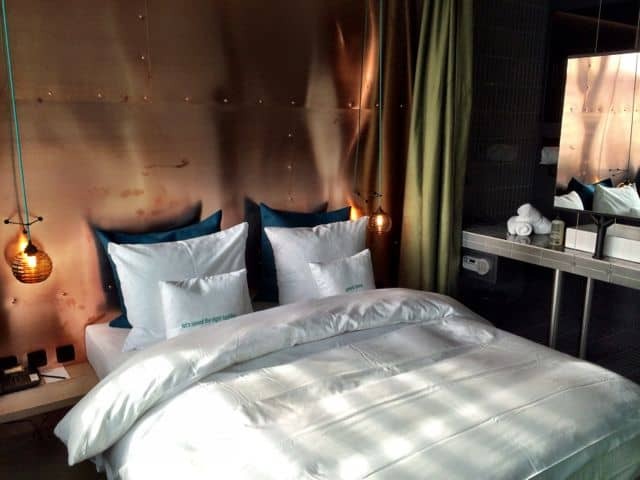 I pretty much loved everything about the 25 Hours Bikini Hotel Berlin. Its funky interior combined with details that prompt interaction or put a smile on my face made the biggest impression on me, not to mention the glorious views from the top floor. Furthermore, its location next to the Zoo and famous sights like the Kaiser Wilhelm Memorial Church, as well as the Zoologischer Garten and Wittenbergplatz U-Bahn (metro) stations is very convenient. All in all, this hotel deserves a huge thumbs up! If you’re in Berlin and looking for a cool place to stay, consider the 25 Hours Bikini Hotel Berlin! I’ll most certainly be back! Read my review of the 25 Hours Hotel Vienna. 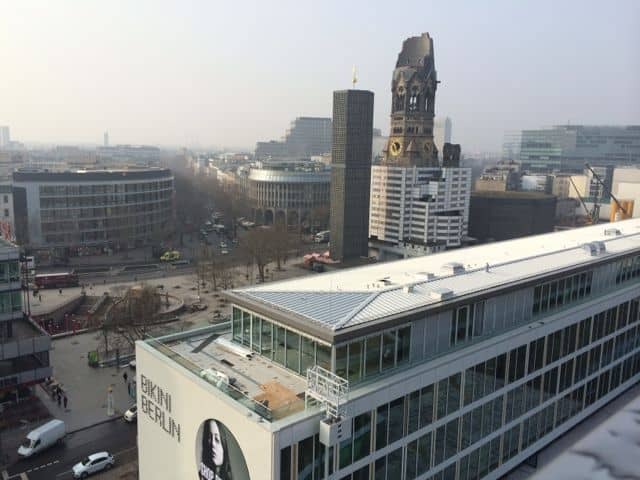 Note: A big thank you goes to 25 Hours Hotel Bikini Berlin for your terrific hospitality. As always, all views stated above are mine and mine only. This is the kind of hotel you can’t wait to go home and tell your friends about, even though you have already instragramed it. No picture will ever do the place justice really – (even if you’ve got mad picture taking skills). It’s such a fun hotel with so many details, great vibe, great character, great facilities – how do you capture all of that with one frame! I’m not a fan of boring beige hotel rooms, so I love reading (and seeing photos of) hotels with quirky decor and fascinating background stories like these. The Hotel looks fabulous. I came from bookin.com where ive seen your Blog Travel listed there! Good job. I didnt know that the bikini’s hotel exists ever especially in Germany.Ill follow all your post from now on. Best regards and keep up the good work. That depends on when you book. Rates start at $110/night. I only wish I was there! But, what is this foot warming business? Cozy place. How expensive was to stay there? Absolutely stunning views and the terrace on the 10th floor looks amazing! Hi Zenaida, yes, if I was living in Berlin, I would be there all the time too! 🙂 The sunsets from the rooftop terrace are indeed stunning! The Monkey Bar and Neni have become an instant favorite meeting place for me and my friends – and we all live in Berlin! Great sunsets, too!